Archives of Eaton Bray News for June 2016. This article was published in June 2016. Please see Latest News for more recent information. St Mary's, Edlesborough, once again hosts the Edlesborough Festival from 24-26 June. Organised by Friends of the Church on the Hill, with concerts on Friday and Saturday evening and on Sunday, bells at 4pm and Songs of Praise with Coralie at 5pm. NOTICE IS HEREBY GIVEN that the Central Bedfordshire Council intend not less than seven days from the date of this Notice to make an Order the effect of which will be to prohibit any vehicle, except a vehicle being used for fire, police or ambulance purposes in an emergency or any vehicle engaged in the event, from proceeding along the lengths of The Orchards, High Street and Moor End, Eaton Bray which extends for their entire length. This temporary closure is required to facilitate the holding of the St Mary's Village Carnival and shall apply to such extent as may from time to time be indicated by the appropriate traffic signs. The proposed Order will come into operation on 2nd July 2016 for a period of three day. 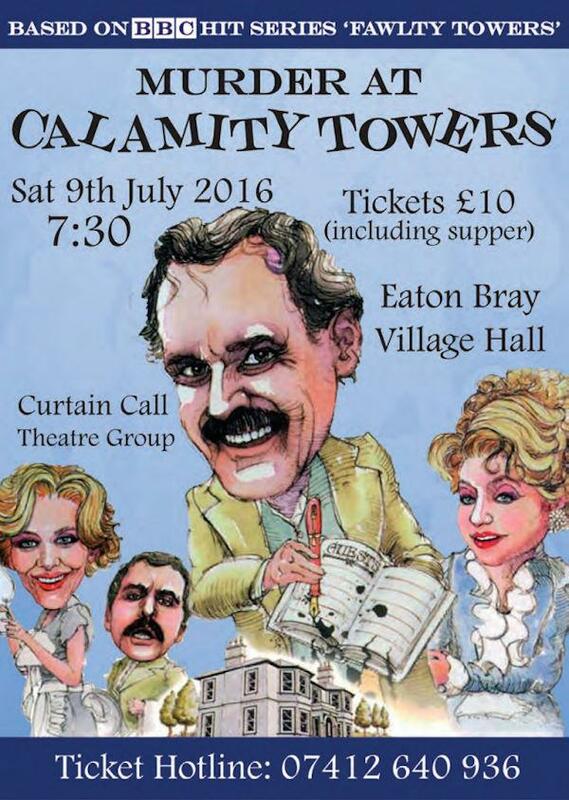 For further information please contact Eaton Bray Parish Council, tel. 01525 221464. As part of an ongoing programme of efforts to enhance the look and feel of the village, EBPC is proposing to install a flag pole on the green by Moor End/Bower Lane. The intention would then be to fly combinations of the Union flag, National flag and the Bedfordshire flag as appropriate, and at times of national celebrations. 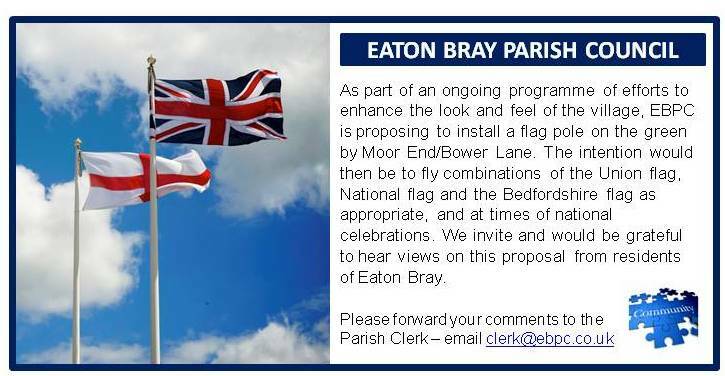 We invite and would be grateful to hear views on this proposal from residents of Eaton Bray. You are viewing the June 2016 archive.